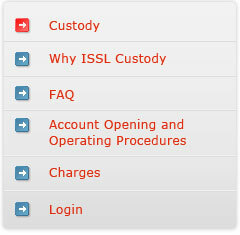 ISSL offers custodial services to a galaxy of customers. Its clientele includes Corporates, Institutions, High Networth Individuals and Non-resident Indians. Under this service it manages the settlements of all security transactions undertaken by the clients on the stock exchanges. It also manages the client securities flow in Demat form. Custodial service also includes safekeeping of client's holdings. ISSL shall liase with the bank for meeting the funds obligations of client purchase and sale trades. ISSL shall be responsible for tracking & monitoring of the Corporate actions arising out of the client holdings.